Let me tell you a story. In October last year I ventured out to the Annual Lions booksale in my area. I had a $10 budget and I think I did really well. I am always on the lookout for…the quirky. In my browsings I picked up “The Audubon Notebook: An Illustrated Journal with Space for Notes” that was filled with handwritten ‘poetry’ scribed in fountain pen. I could not resist. 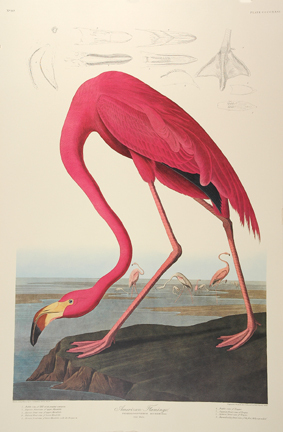 It also had a pink flamingo on the cover which I have a special penchant for. I had a quick flick through and then put it on my bookshelf where it remained until a few weeks ago. So recently I got the book out and unstuck the first couple of pages and I found the following inscription “The Way of Life, according to LaoTze. Translated by Walter Bynner. Lyrebird Press” – well doh! and wow!. It appeared just at the right time as well. I have a liking for botanical/natural images although I squirm a bit at Audubon (maybe because they are so widely reproduced). However it all came together in this little book. The final page reads “To love a person is to/ let them Be and and allow/ the Tao to take care of/ them. Non interference”.